You are currently browsing articles tagged “San Francisco Bay”. Before the salt in evaporating sea water turns white, it goes through stages of color that range from jade green to brick red, with variations of orange, yellow and other colors. 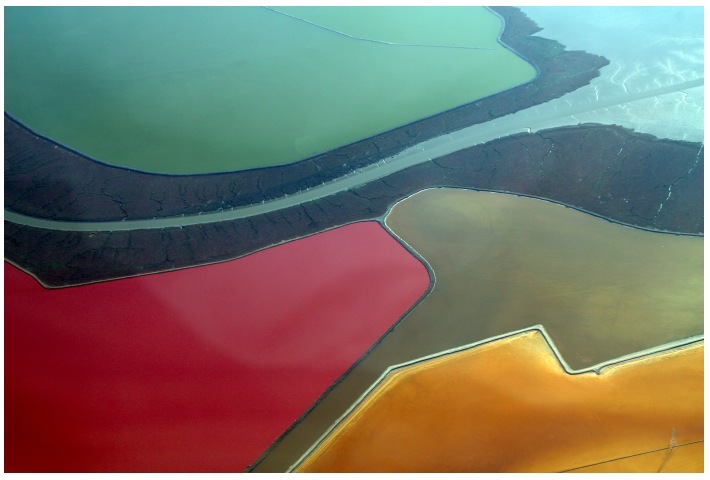 From above the salt ponds around San Francisco Bay look like giant panes of stained glass. The shot above is from my latest set, shot on approach to SFO last week. 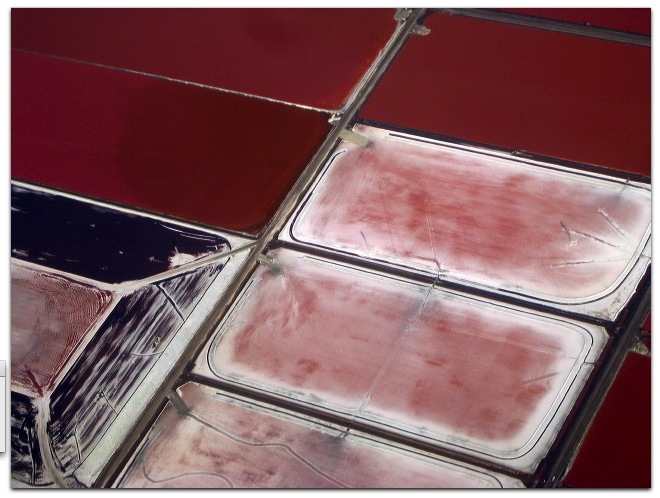 These are a few among the many salt ponds that ring the south end of San Francisco Bay. Once considered and agricultural innovation and an economic boom, the practice of “reclaiming” wild wetlands for industrial purposes is now considered ecologically awful by environmentalists, especially here on the West Coast of the U.S., which has precious few wetlands in any case. Many environmentalists have been working to get Cargill to close the ponds and return the Bay to its more natural state. Cargill hasn’t budged. In fact, <a href=”http://www.cargill.com/sf_bay/saltpond_ecosystem.htm”>Cargill has its own views</a> on the matter, plus some interesting facts about the ponds themselves. I took this shot two days ago on approach to San Francisco on a flight from Boston. Here’s a set of all the photos I’ve taken of salt ponds, both here and in the desert. And here is the whole set of shots I took from coast to coast. Most were at the ends of the flight, since the sky was undercast most of the way.